Environmental stress screening (ESS) is a process where new or repaired electronic components are placed in a testing chamber and exposed to thermal cycling, vibration, and other environmental stresses. The purpose of ESS is to force the manifestation of latent mechanical defects that result in permanent or catastrophic failure of the component. This testing helps ensure the quality, functionality, and reliability of electronic hardware and components during shipping, storage, and use. PCB environmental stress testing is typically conducted during the design and development stages, and after the components are installed in electronic equipment. Environmental stress screenings are designed to test your PCBs and components against the potential rigors of their intended environments, harsh or otherwise. Plasma Ruggedized Solutions uses this technique to measure the long-term reliability of products throughout their working life and to create systems to protect them against harmful environmental factors. We use a large, in-house, temperature- and humidity-controlled chamber to perform environmental test screenings. Tested components are run through several cycles of rapidly fluctuating temperature and condensing or non-condensing humidity, with dwells at both high and low extremes. This simulates the range of environmental conditions that the tested devices will be subject to, and allows us to determine if our coating solutions have achieved the desired effect that the customer is looking for. Contact our San Jose or Huntington Beach locations to learn more about how environmental stress screening for electronic components. Environmental stress screening lets us make necessary adjustments after testing to maximize the effectiveness of the conformal coating and potting/encapsulation process we’ve applied. It is a highly effective and reliable test, which allows Plasma Ruggedized Solutions to improve our processes continually. What Are the Different Types of Environmental Stress Screening? Electronic components are subject to various levels of shock during packaging, shipping and in the application environment. Mechanical shock testing helps determine how well electronic equipment can handle these shocks and any effect it may have on the functionality of the product. Environmental conditions and a product’s operating environment can both affect the functionality of electronic components. During thermal shock testing, electronic hardware is placed in a chamber and exposed to extreme temperature ranges, known as thermal cycling, to determine whether the components can withstand sudden changes in temperature. Temperature humidity testing involves placing electronic hardware in testing chambers to examine how changes in temperature and humidity influence the functionality of the electronic component. This test is useful for determining how well electronic equipment handles the various environmental conditions it will be exposed to during shipping and storage. Vibration testing involves shaking and vibrating electronic components using various force ratings to test how the product will withstand shipping. 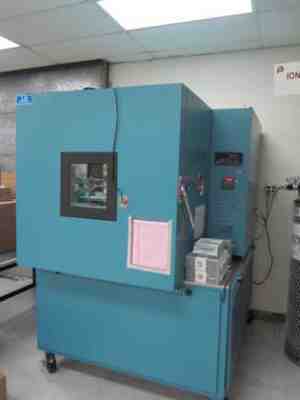 Vibration testing is also used to determine fatigue, which directly impacts the life cycle of an electronic component. Contact us for more information about our environmental stress screening process and how it can improve your next project. Plasma Ruggedized Solutions provides several testing and laboratory services including ionic testing, two-dimensional X-ray diffraction, and more to ensure the functionality of your electronic components. We also provide conformal coating services, potting and encapsulation, and more.